Lock in a great price for Byblos Comfort Hotel – rated 8.1 by recent guests! Every thing was excellent! We arrived earlier than planned and were let into the room before 10:00 AM! Location is great and the staff was extremely helpful. We stayed in the comfort suite which has two bedrooms and a decent-size living room. Kitchen is very basic with a kittle and a microwave but no cooker. 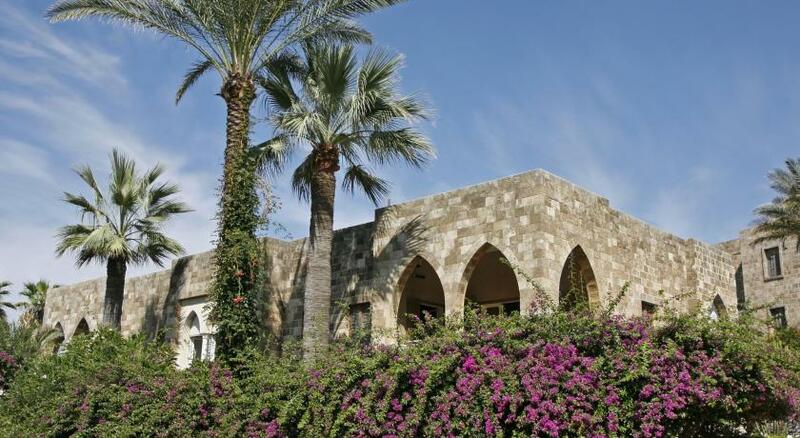 Byblos itself is a beautiful location; this hotel was about a 5-minute walk from the beach. The hotel looks rather new, as does the furniture. The breakfast wasn't spectacular, but it was good. Air conditioning was wonderful after coming in from the heat and humidity. Staff was friendly enough - we tried checking in early and they would have allowed us had the previous occupants left early; they did let us keep our luggage there though. 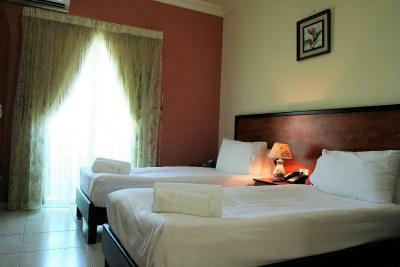 The staff where very nice and welcoming, the price was good, the location is pretty central and calm at the same time, the rooms are clean. 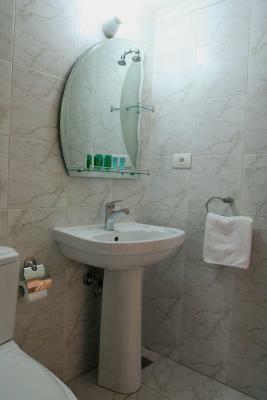 Very clean, friendly staff and the location is a 3mins walk from the market and a 5mins walk to the beach. Breakfast had a lot of varieties. Good location to the port for 5-7 minutes to go. 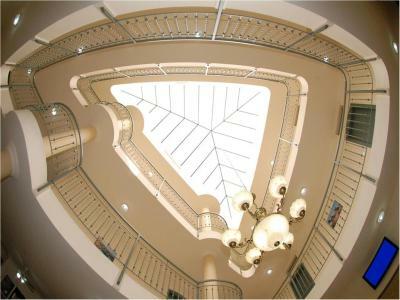 Beautiful and charming hotel. Delicious Breakfast. The hotel has its own Parking. Near the hotel there are shops and cafes. 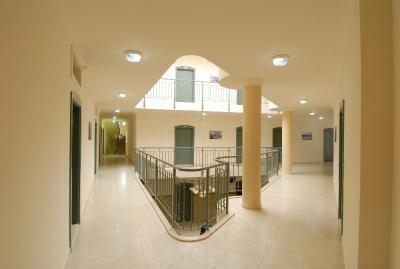 Also next to the complex archaeological site and shopping arcades. The room had a kettle, cups and tea accessories! The lacation is excellent, just 5 min walking from the old souq. 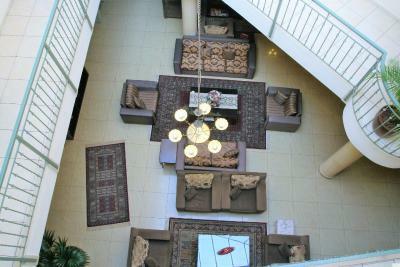 It has a big parking in the building which is very comfortable. 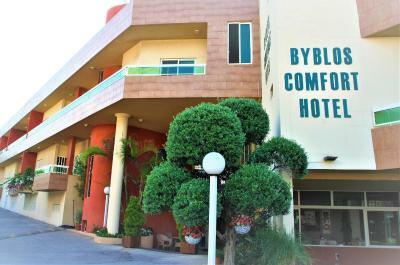 Byblos Comfort Hotel This rating is a reflection of how the property compares to the industry standard when it comes to price, facilities and services available. It's based on a self-evaluation by the property. Use this rating to help choose your stay! 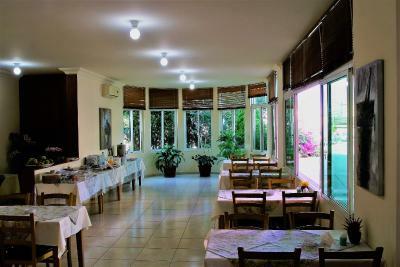 Hotel Byblos offers air conditioned suites and a restaurant serving regional delicacies including vegetarian and marinated meat dishes. It is half a mile from Byblos Castle and the beach. 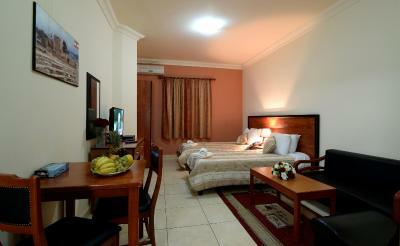 All suites at Byblos are simply furnished and are equipped with a full-length wardrobe and a work desk. Each room has a TV and a well-stocked minibar. 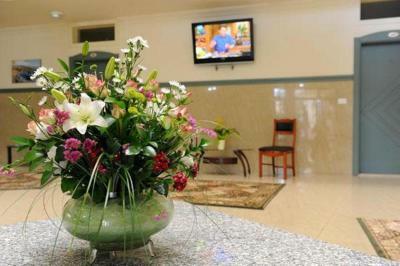 At Byblos Hotel, guests can use the 24-hour shuttle service or ask the friendly staff about renting a car. Currency exchange service is also available here. 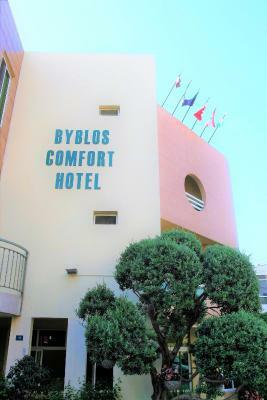 Byblos Comfort Hotel is half a mile from Byblos Port. It is a 15-minute drive to Casino du Liban. 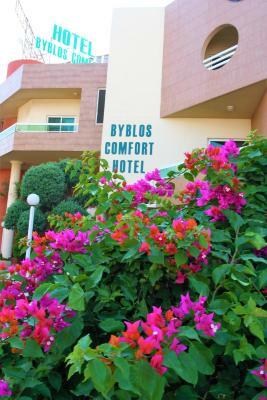 When would you like to stay at Byblos Comfort Hotel? 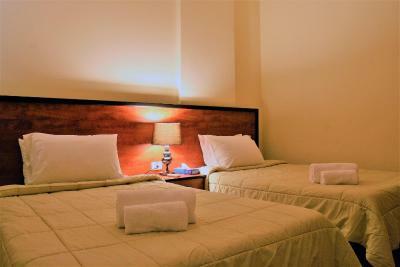 This suite offers 2 single beds, 2 double beds, 1 sofa bed and 1 large double bed. 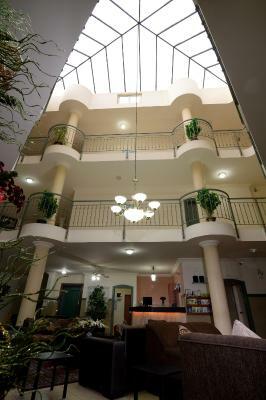 This suite offers 1 single bed, 1 double bed, 1 extra large double bed and 1 large double bed. 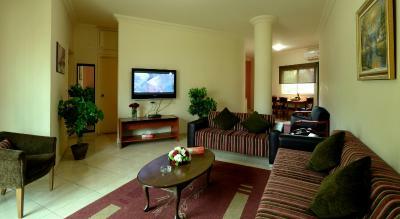 We are pleased to introduce our three stars hotel located in the heart of Byblos city. Byblos comfort Hotel is a short walking distance from the citadel, the old port, the sea, the shopping centers and the restaurants of Byblos. 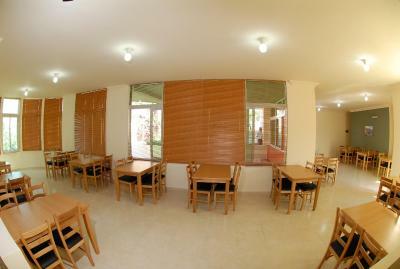 The rooms are newly built and furnished, equipped with all the facilities needed to make you feel comfort. 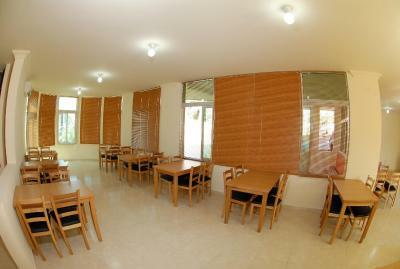 Byblos Comfort Hotel offers you a restaurant, a conference room, in addition to an indoor parking. 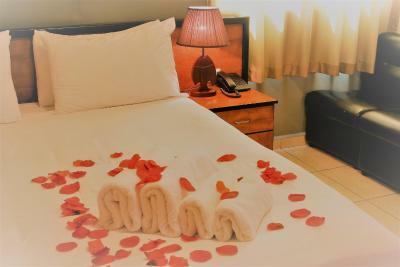 Byblos Comfort Hotel is a newly opened three floors property, consisting of 46 suites distributed as follows: •	Junior Suites: one bedroom, kitchen and a private bathroom. 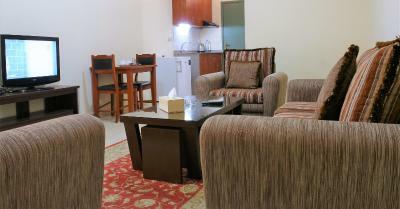 •	Executive Suites: one separate bedroom, sitting area, kitchen, private bathroom (bathtub/shower) and balcony. 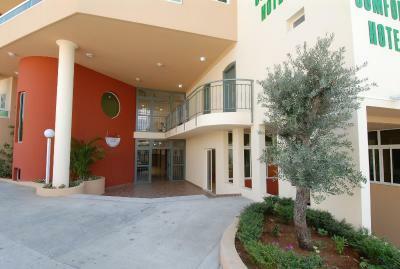 •	Comfort Suites: two separate bedrooms, sitting area, kitchen, private bathroom (bathtub/shower) and balcony. You are invited to visit Byblos Comfort Hotel in order to have an idea of the biggest and newest three stars hotel currently available in Byblos city. 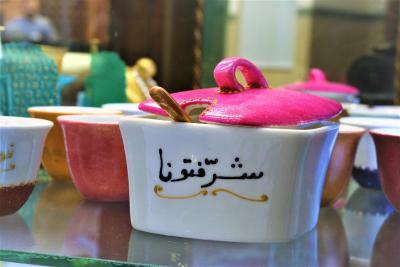 House Rules Byblos Comfort Hotel takes special requests – add in the next step! 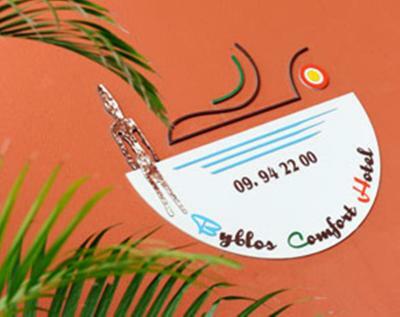 Byblos Comfort Hotel accepts these cards and reserves the right to temporarily hold an amount prior to arrival. Very disappointed from the weak WiFi connection, internet connection keeps disconnecting and it’s very weak and it doesn’t cover all the areas of the room and Hotel. The room description is not accurate as they described the executive suite of having a sofa bed but in fact the sofa in the suite is a standard sofa and not a sofa bed as described on Booking.com. The worst thing happened to me is when I was asked upon check-out to pay again for my stay despite that I fully paid for my stay upon arrival, I had to tell the receptionist why you’re asking me to pay if I have fully paid? Then he said it’s ok and that was very weird to me! Breakfast is poor and the most important aspect of the breakfast is not available such as the coffee and hot milk, instead they provide Nescafé sachet and hot water and it’s completely self service without the presence of a waiter or waitress. The kitchenette cabinet was empty of any kitchen tools, no utensils at all. In general this wasn’t the perfect hotel for us and I wouldn’t return to this hotel again as other better choices are plenty. In the bathroom I saw a cockroach it spoiled the overall impression. staff are very friendly and helpful... highly recommended! Room furniture was very old. Curtain doesn't close 100%. Air condition very old and noisy. Poor breakfast. 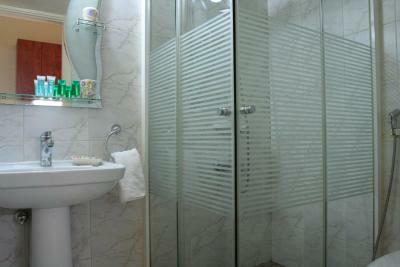 Horrible bathroom.